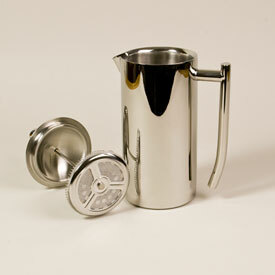 Sorry, we are currently sold out of 'Frieling Stainless French Press'. Please check back later. Frieling makes this beautiful and elegant French Press completely of 18/10 stainless steel, polished on the outside and brushed inside. Capacity is 35 ounces - about 4 large mugs of coffee or 6 traditional cups. In addition to being great to look at it is also highly functional because its double wall insulation keeps coffee hot longer. It can be used for iced drinks too with the same insulating benefit. Remove the plunger top and the beaker serves as a stylish pitcher for any beverage, hot or cold.